The Danish AV CENTER and Panasonic contributed to one of the biggest shows in the competition’s history by proving a superb visual experience for the audience and the contestants in the green room. With more than 170 million viewers from 45 countries this year’s Eurovision Song Contest was one of the biggest shows in the competition’s history. The Danish AV CENTER and Panasonic was delighted to contribute to this event by proving a superb visual experience for the audience and the contestants in the green room. The Eurovision Song Contest has been broadcast every year since its start in 1956. Today, it is one of the longest running musical contests in the world and without doubt Europe's favorite TV show. This year Eurovision fans gathered to celebrate music and diversity in Copenhagen, Denmark. The event took place in two old industrial halls on a small island next to the capital city. One of the most beautiful settings was chosen, however, building construction wise and technologically not prepared to host a show of this scale. It took one year of great efforts from the Eurovision Team to transform it into the most spectacular venue called the Eurovision Island. Not only the scene and the TV set up had to be flawless, it was just as important for the Eurovision Team to provide a perfect visual experience for the 11,000 spectators as well as the show contestants waiting for results in the green room. 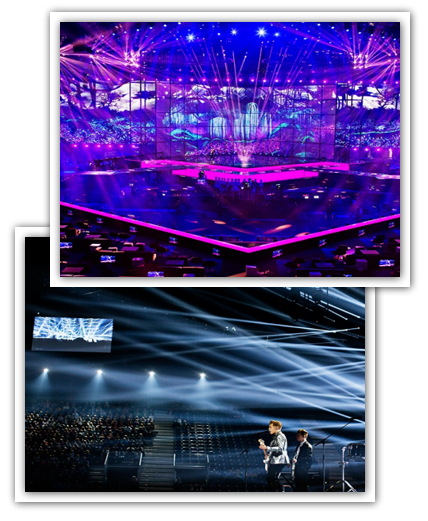 The Danish AV CENTER together with Panasonic joined the Eurovision Team to realize this vision. 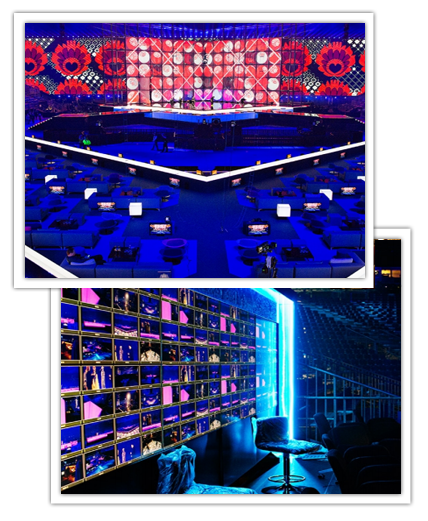 “In tight collaboration with Panasonic we managed to meet the organizers high expectations by providing reliable, state of the art technology for the enormous backstage area at the Eurovision Song Contest. We delivered eight displays for the spectators of 6.5 meters size each, more than 130 flat panels for the backstage area, and I could go on and on with products and solutions we delivered,” explains the Rental Manager Mikkel Behrend from AV CENTER, in charge of the AV and visual solution behind the scenes. The multiple screens gave the audience, contestants and the huge backstage crowd a vivid picture experience and the feeling of being close to the performers on stage no matter where they were at the venue. The sparkling eyes, the shimmering gold dress and the dark beard of this year’s winner, Austria’s Drag Queen Conchita Wurst, was all very clear to the competitors in the green room and to the audience seated in the back row, thanks to the monitors’ magnificent picture quality, high resolution and stunning colors. For a show of this scale nothing can be left to chance. Everything needs to turn out perfectly down to the smallest detail. When the show is on air, there is no time for mistakes – the audience expects a perfect performance with no breakdowns and the international press will let Europe know even if the technology is not working backstage. “Of course, after 6 months of thorough preparation, we were quite nervous when the show finally began. We all liked to be close to the venue in these hours. We made sure to have backup systems for the main equipment ready, because it was not possible to climb 40 feet up to the ceiling once the show was in progress. We can proudly say that everything went smoothly with no need to use the backup plan,”says Mikkel Behrend, Rental Manager, AV CENTER. The huge AV delivery has been a great deal for both the organizers, Panasonic and the Danish AV CENTER. “The organizers were looking for a professional solution at a low cost. I right away had to join forces with Panasonic. Here at AV Center we had the knowledge, manpower and all the cables whereas Panasonic had all the needed equipment. I think Panasonic could see the gains in sponsoring the event with their technology, they demonstrated the functionality and strength off their products. And on a personal note, I was overwhelmed by the support I got from Panasonic from the start to the end,” explains Mikkel Behrend, Rental Manager, AV CENTER. It is not every day an AV supplier gets the chance to work at a worldwide show of this scale. For the Danish AV Center it has been the biggest task to date from which the whole team benefited significantly. Thanks to the careful planning and preparation, the team optimized the process to an extent where they could even handle all ad-hoc task requests efficiently. “Without blinking, I would do it again. We have now proved that we can. I hope that we are going to deliver solutions in this dimension again, hopefully together with Panasonic. Together we carry the black belt and with inner calm we can say "Bring it on,” says Mikkel Behrend, Rental Manager, AV CENTER.